The beginning of the Tomoe arc (also the basis for the OAV) and it is my favorite part of the manga. Yeah, the rest of the books were good, but frankly, the series majorly drooped towards the middle. It gets interesting again when we meet Enishi, Tomoe's little brother, who is out for vengeance against Kenshin, whom he holds responsible for his sister's death. 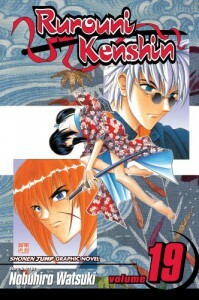 From this volume, we get a deeper glimpse of Kenshin's earliest days as a swordsman. If you skipped most of the manga through the boring arc (what I call volumes 5 onward), pick it up again here; this part is amazing.